"Iceberg, Right Ahead!" Only 160 minutes passed between the time a sailor on lookout duty uttered these chilling words and the moment when the mighty ocean liner Titanic totally disappeared into the cold, dark waters of the North Atlantic. This century-old tragedy, which took more than 1,500 lives, still captivates people in the twenty-first century. Seventy-three years separate the two major Titanic events—the 1912 sinking of the vessel and the dramatic 1985 discovery of the wreck by Robert Ballard. But additional stories about the victims, survivors, rescuers, reporters, investigators, and many others show the far-reaching effects this tragedy had on society. Award-winning author Stephanie Sammartino McPherson has collected numerous personal accounts of the event, including the knighted man who spent the rest of his life in seclusion because he was accused of dishonorable behavior in a lifeboat, the stewardess who survived two shipwrecks and a mid-ocean collision, and the New York Times executive who sent multiple reporters to meet the rescue ship, thus earning a national reputation for his newspaper. She also links the Titanic tragedy to changes in regulations worldwide. After a Senate Inquiry and a British trial attempted to assign blame for the disaster, new laws on ship safety were put in place. A group of nations also banded together to form an ice patrol, eventually leading to the formation of the U.S. Coast Guard. Even the most avid Titanic fans will learn something new as McPherson brings the reader up to date on the politics and intrigue still surrounding the wreck—including what modern science can reveal about what really happened to the ship and who was at fault. Prepare to follow the never-ending story of the Titanic into its second century. Iceberg, Right Ahead is the first of many books I'll be reviewing or spotlighting as we get closer to April, and we remember the 1,517 people who lost their lives exactly one hundred years ago on the night of April 14/15 of 1912. Author Stephanie Sammartino McPherson has written a fact filled account of the tragedy that was Titanic. Just about 100 pages in length, she easily shares accounts, photos and enough information about what happened after the survivors returned home, to engage a reader of any age. Iceberg, Right Ahead is directed at a YA audience and I think that's such a fabulous thing! There are many lessons to be learned and McPherson touches on the most important, that actions matter and lives and reputations can be ruined with false accounts and misinformation. She also tells of the great heroism, from so many people in all walks of life that night. The term "women and children first" bring a whole new concept to how life was a hundred years ago, both good and not-so-good. Iceberg, Right Ahead is an easy read and a gorgeous read thanks to the many photos. I especially like that she included the "unsinkable" Margaret (Molly) Brown, Titanic's Captain Smith and also the recovery mission of Robert Ballard in 1985. 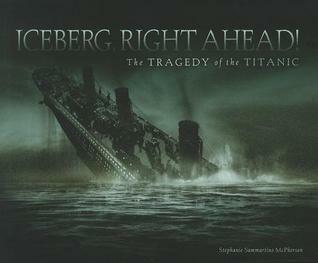 Iceberg, Right Ahead is a great way to introduce readers of all ages to the human and the physical tragedy that was Titanic. I've always been mesmerized by the accounts of the Titanic and I hope this book will entice another generation to learn more about how the unsinkable Titanic when down in a few hours. * This book was provided to me by the publisher through NetGalley, and that in no way affected my honest review.